We had a fair idea of what the accommodation was going to be like in Dubai, where we stayed prior to arriving in Amman, Jordan. Situated in the Marina, it was always going to be pretty good. Thanks also to using some of Veronica’s Etihad airpoints, it was pretty much free. We were less sure, however, about what we were going to get in Amman. 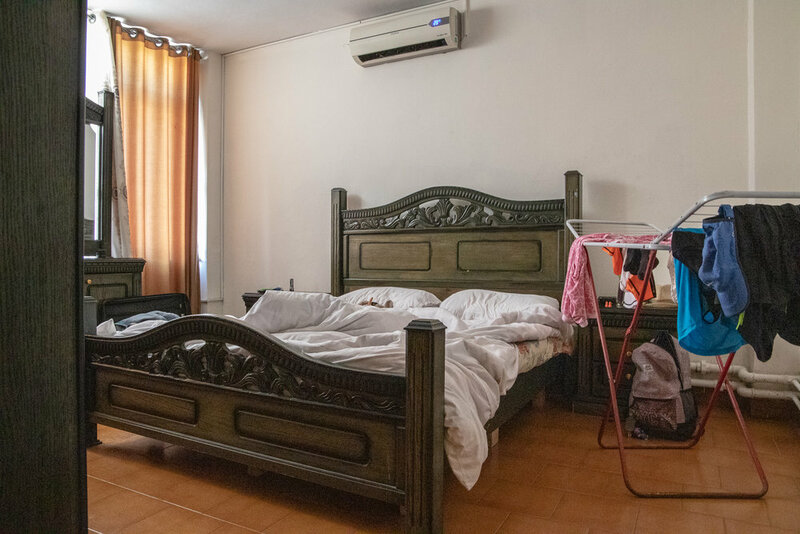 As booking agent, the quality of our accommodation at the our first place, would dictate the trust the rest of the family would have in my abilities going forward. I definitely felt that my reputation was on the line. Coming in from the airport, I got a sense that all might not be well when the taxi driver stated we had got a very good price for our accommodation, after I told him what we’d paid. 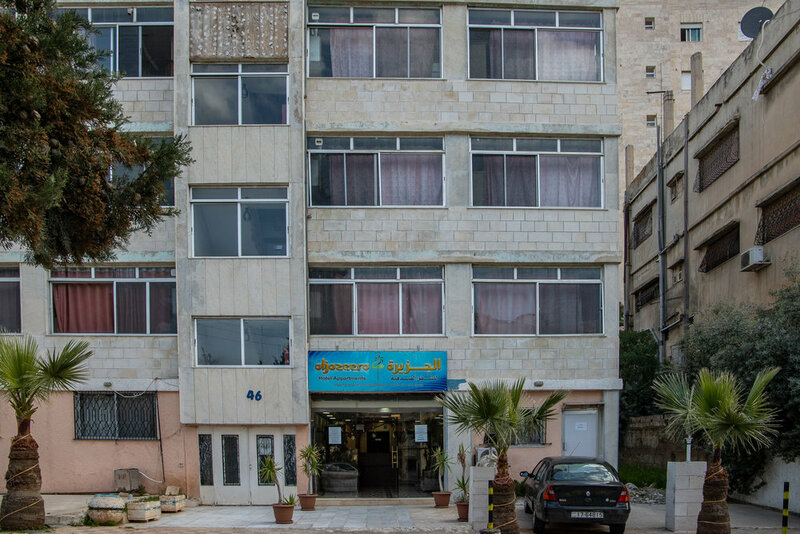 The front part of the hotel certainlhy didn’t inspire confidence, but Sohope (supposedly meaning Ginger in Arabic) on the front desk, was as friendly as could be and gave us a quick run down of the working features of the rooms before trying to upgrade us to the full B&B option. The lounge is definitely the main feature of our two bedroom apartment that we’re booked into for five nights. 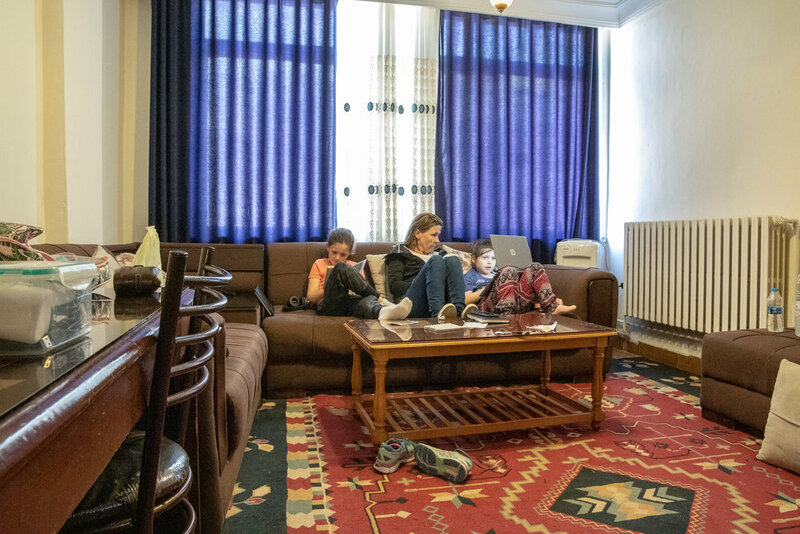 Plenty of room for everyone to recuperate after a hard day out sightseeing in front of the flat screen TV which supports more than 200 channels - 99.5% of which are in Arabic. Thankfully, we’re not here for the TV. The bedrooms have, as we say in the business, potential. Heat pumps for the cold nights (around 7 degrees on some nights), a big queen for us and two singles for the girls. Somewhat surprisingly, the mattresses actually were quite comfortable. 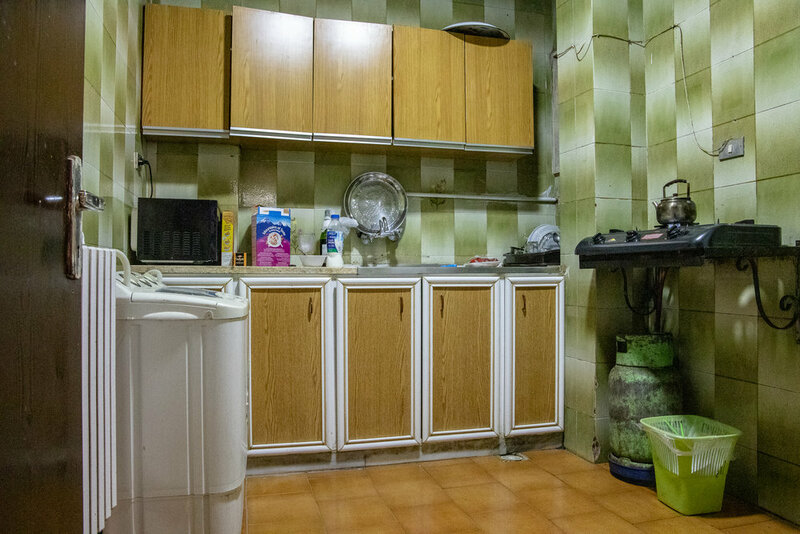 A gas cooker features in the kitchen, along with a large fridge and even a microwave. Most of the mod cons, certainly are available and what it lacks in functionality, it more than makes up for in charm. 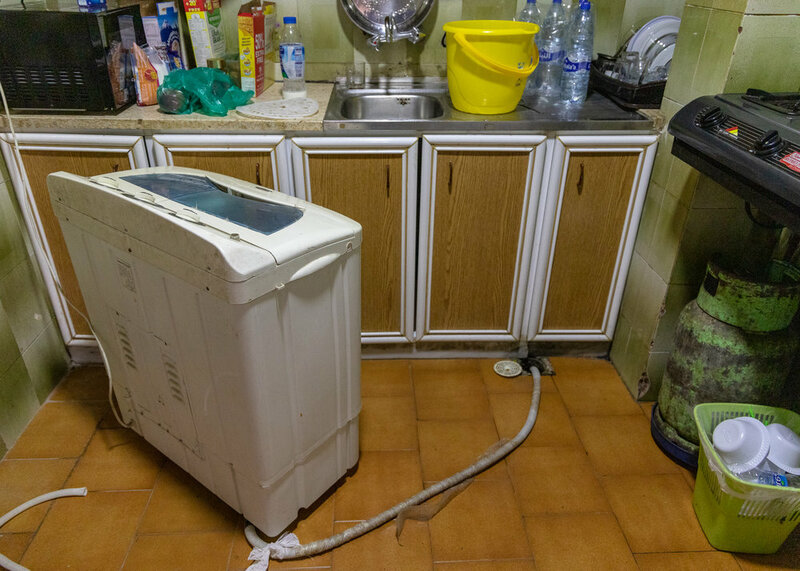 The kitchen also doubles up as a fully functioning laundry to ensure we remain presentable on our trip. This front loader comes with a bucket to ensure optimal amount of water is delivered to each load. And there’s also the added bonus of having a clean floor after slopping water when transferring from tap to machine. 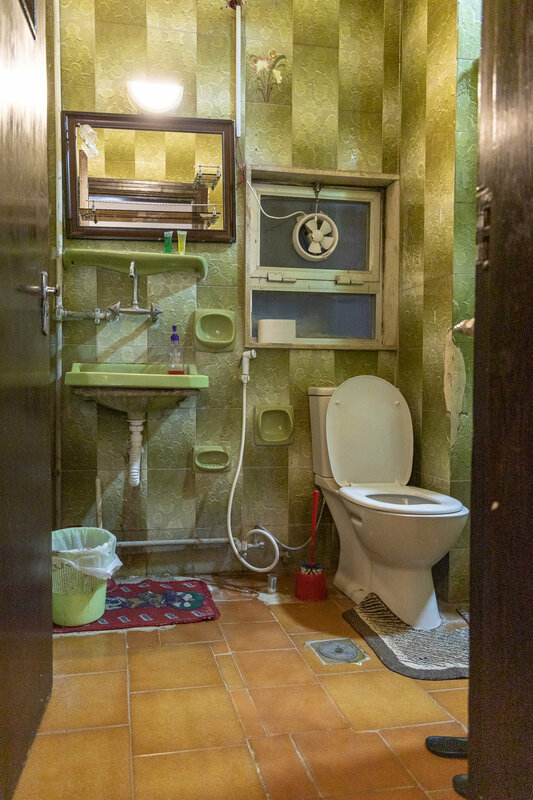 The charming bathroom also could be said to have plenty of potential. A shower that provided hot water only if you turned the cold tap on, a comfy toilet and running water from the faucet. Perpetually running. The kids complained about the place being scary. Veronica wasn’t too impressed either. The only scary thing I found was the prominently displayed “Entering or Drinking Alcohol Drinks is Forbidden” sign. Like this post, I’m sure it was meant as a joke rather than literally……. All up, not a particular auspicious start to my new career as travel agent. Working in finance was definitely a whole heap easier than this. All jokes aside, we have no idea whether this is what we should’ve expected for the money we paid. You also couldn’t fault the hospitality that the staff showed us, who were genuinely nice guys. When you’re looking for positives, as I always am, the fact is that we were mostly comfortable, it was close to amenities and I could run to the Citadel (the main attraction in Amman with stunning views) and back as part of my afternoon run. And once my eyes had accustomed to the green tint, even the shower afterwards wasn’t that bad. In addition to all this, I’d like to think that it served as a good lesson in adaptability for us all. Onwards and upwards from here, and all that.